We are now at the mouth of the Columbia River, aboard the Tonquin, when the War of 1812 broke out, ending John Jacob Astor‘s dream of a monopoly on the fur trade in North America. John Jacob Astor (17 July 1763 – 29 March 1848), had just founded the Pacific Fur Company (PFC). The demise of the Tonquin, a bark, at the Clayoquot Sound, was a factor in the collapse of the Pacific Fur Company. Chief Wickaninnish and members of his tribe, murdered most of the Tonquin’s crew. At Fort Astoria, in the Oregon country, nearly everyone was British. Fort Astoria quickly became Fort George. The Montreal-based North West Company, rivals to the Hudson’s Bay Company, bought the Pacific Fur Company‘s assets. I am reading online publications of Gabriel Franchère‘s narrative of the journey that took him from New York to short-lived Fort Astoria, as well as my own copies of such works as Alexander Ross’s account of his adventures in the Oregon country. Gabriel Franchère, a clerk, was one of John Jacob Astor’s most trusted employees who, as it turns out, would become an author. Franchère wrote a detailed Relation, a narrative, of the trip that took him and all men aboard the Tonquin, from partners in the Company to the lowliest employees, from New York to Fort Astoria, around Cape Horn. In 1836, John Jacob would commission famed author Washington Irving (3 April 1783 – 28 November 1859; Rip van Winkle) to write Astoria. Consequently, Franchère’s narrative was requisitioned. 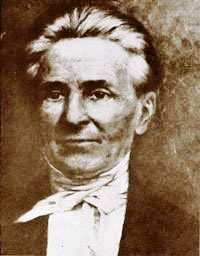 Gabriel Franchère was a mere clerk. In Franchère’s Narrative, translated and edited by J. V. Huntington, Aboriginals are often referred to as “barbarians” and “savages,” but Franchère observed that it was best to treat them as equals and thereby avoid hostility. I don’t know what led Chief Wickaninnish to murder most of the crew of the Tonquin. Coincidentally, my husband and I spent our honeymoon at Wickaninnish Inn, on the west coast of Vancouver Island, in the area where the Tonquin was destroyed. The food was extraordinary and we were in the company of celebrities who flew to the Inn regularly to “get away from it all.” At the time, there was no road to Wickaninnish Inn. We had Long Beach all to ourselves. 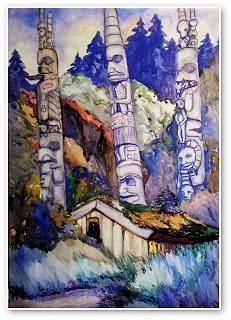 Emily Carr had lived in that area. So we visited and worshipped. When we returned to Vancouver, I took a course on textile and was taught the Haida people‘s techniques for spinning, dyeing, and weaving wool. I still have wool I spun decades ago, but I gave my artwork. I believe it was destroyed, which could be what it deserved. The years I spent on the west coast were my happiest. 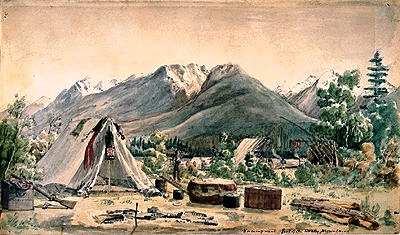 Gabriel Franchère‘s account presents a unique picture of the Pacific Northwest in the early 1800s. A Kindle version of Narrative of a Voyage to the Northwest Coast of America in the years 1811, 1812, 1813, and 1814 or the First American Settlement on the Pacific is available for free at http://www.amazon.com/Narrative-Northwest-America-American-Settlement-ebook/dp/B00846XAA4/ref=sr_1_1?s=books&ie=UTF8&qid=1434741662&sr=1-1&keywords=Franch%C3%A8re. I apologize in being late responding to your comments and suggestions. Thank you so much. I will get the book. I like Franchère. He was unassuming and always did his duty. I have a great deal of admiration for persons like Franchère: humble and dutiful. He was so pleased to have found employment. Fortunately, he had a very good command of the French language and was a gifted writer. I thank you very for sending me the link to a free copy of his book. That is very precious to me.